The CM 750 is designed to meet the demanding requirements necessary for an industrial printer. High reliability, even in the harshest working environments. Working with the CM 750 is made easy by the quick and clean cartridge-changing facility. Simple to install and operate via a clearly visible 10-inch touch screen. As standard, the CM 750 is fitted with an economical ink and solvent system. The filter can be replaced easily (by you) which consequently keeps maintenance costs down. The CM 750 can be driven via a networked or local scanner. The CM 750 is up to the job. 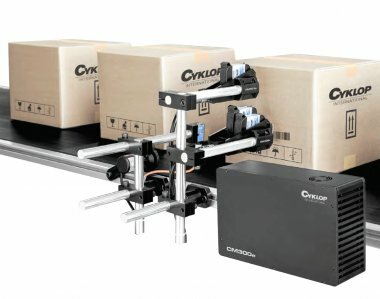 The Cyklop CM 300E is the advanced solution for your coding requirements. Using the tried and tested HP cartridge technology, high-resolution prints are produced on your packaging. 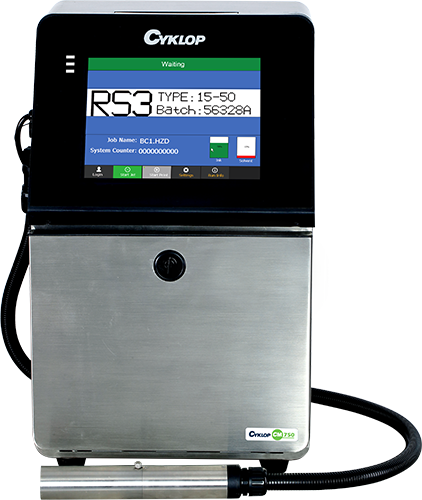 The CM 300E is specially developed for integration into production systems that are operated by PC or touch screen. Up to 4 cartridges can be fitted, enabling double-sided printing or printing to a height of 50.8 mm. Company information such as bar codes, logos and manufacturing dates can be quickly and neatly printed in outstanding print resolution. The printer is very solidly built, enabling the CM 300E to be installed without difficulty in any industrial environment. 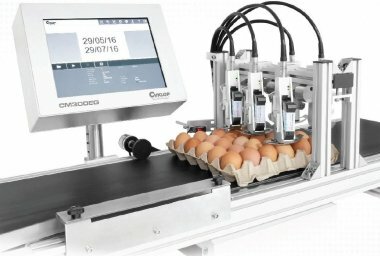 Based on the easy use of the CM 300 with a 12″ touch screen display, the CM 300EG offers the prerequisites for marking eggs cleanly and simply in a 5×6 tray. 5 cartridges are mounted on a particularly flexible print head holder, thus protecting these sensitive products. Food inks for marking the eggs in the colours red, green and blue are available. With the built-in calculator for the expected ink consumption, the printing costs can be determined and optimized right from the start. 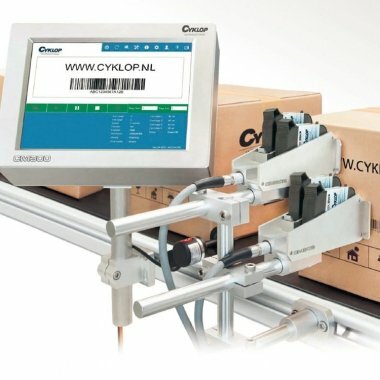 The Cyklop CM 300 is the advanced solution for your coding requirements. Using the tried and tested HP cartridge technology, high-resolution prints are produced on your packaging. Up to 4 cartridges can be fitted, enabling double-sided printing or printing to a height of 50.8 mm. The controls and programming can be adjusted easily with the colour touch-screen control panel. 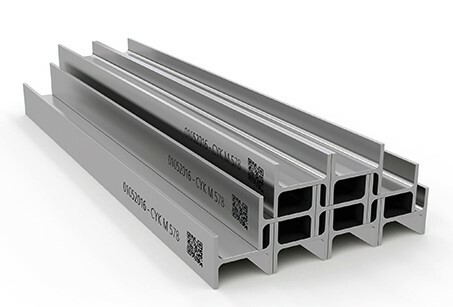 Company information such as bar codes, logos and manufacturing dates can be quickly and neatly printed in line on your products. The printer is reliable and very solidly built, enabling the CM 300 to be installed without difficulty in any industrial environment. The CM 200 is equipped with a double printhead which enables more information to be printed. The printer is easy to operate from a PC’s browser or via an Android app. Ethernet or Wi-Fi are available as interfaces. Can be operated without a display or keyboard which prevents manipulation of important print data and enables integration in hard-to-reach positions. The start signal can come from the integrated photocell or optionally via an external photocell. 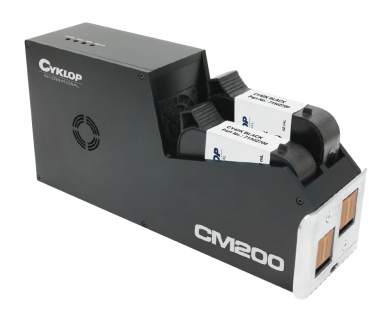 The CM 200 has the same functionality as the CM 150 but with a print height of 25.4 mm. The CM 150 is very suitable for integration into production systems and has the same compact design as the CM 100. It can be set up easily using a browser on a PC or via an Android app. Ethernet or Wi-Fi are available as interfaces. Can be operated without a display or keyboard which prevents manipulation of important print data and enables integration in hard-to-reach positions. Printing can be managed using the integrated photocell or an optional external photocell. The CM 100H is a manual coding system based on HP technology. The device is fully wireless. You can code anywhere with it. 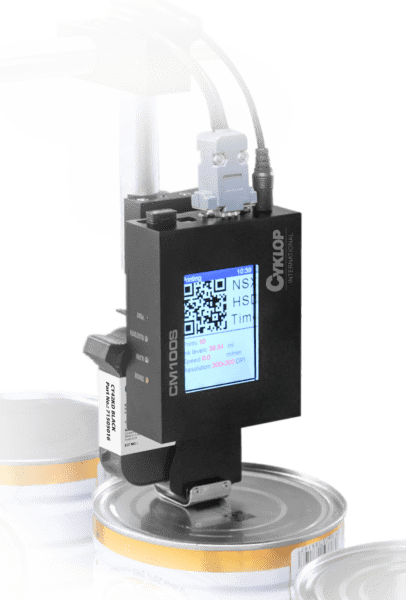 The CM 100H prints text, logos, variable data and bar codes on porous and non-porous surfaces. The information can be set up via Bluetooth, USB or wireless keyboard. 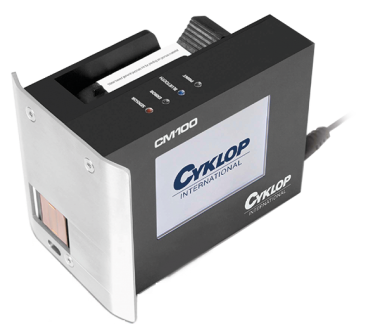 The Cyklop CM 100 is the basic model high-resolution inkjet printer and is suitable for printing on a range of materials. 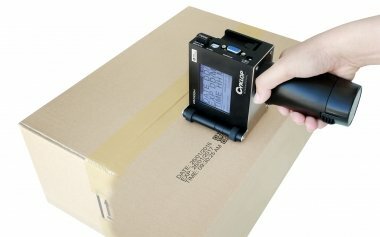 Thanks to its solid and compact design, the CM 100 can be effortlessly integrated at different stages within the packaging process. The ink cartridges are available for porous and non-porous surfacess and are quick and easy to change.